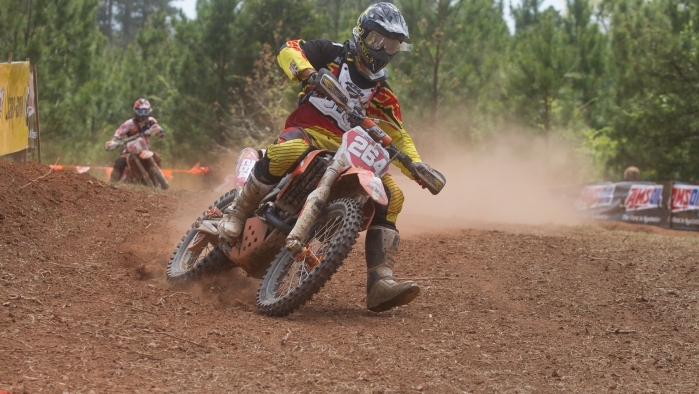 Round three at the Big Buck GNCC was fun. After seeing mud at the first three rounds, I was pumped to have a dry race! My start was not good…my bike decided to not start when the flag flew, so I was last going into the first turn. I knew I would be good in the open field sections, so I went to work passing guys and trying to get to the front. I made a lot of passes, some in the open and some in the trees, and got up to 3rd by the start of the second lap. I pushed the pace then and tried to gap the guys behind me, and hopefully catch the front-runners. I pushed a little too much going down one of the hills and ended up in a mud hole somehow. The whole track was dry except for that one spot! I got stuck for about 30 seconds, and that let a few guys by, putting me around 6th. I battled with Delong and Ashburn for the next four laps. I felt great and made my way back up to 4th at one point. A little after the two hour mark, I started getting some cramps and bad blisters. I rode the best I could until the end, but the slower pace I had to run let a few guys catch and pass me. Another 9th is not what I wanted, but I felt like my speed was really good and I learned a lot. I know I can run at the front. Once my fitness catches up and my hands get tough, things will get better. I'm looking forward to battling for a win.